Click here to see the grey Busch Stadium bleacher seats. Color and condition of wood will vary slightly due to years of wear. It is classy and a great conversation piece! It was a great gift for my 14 year old baseball loving brother. It didn't bother him too much but when opening the box we were told that "Product may cause illness" I realize it's from a stadium but it should be checked before sold to the public. Especially when the majority of buyers are children or teenagers. But it's not too much of a worry. product is unique and fun for a fan, but for the price the chain its on could have been much better to make it a more stylish and high end product. What a wonderful gift for a baseball lover! Owning a piece of history and your favorite baseball team- all the memories wrapped up into one unique gift. This was the most perfect gift for my 28 year old daughter. She's watched Cubs games with my husband since middle school and is a real fan. As a professional woman, the design is stylish enough to wear with suits, simple enough to wear casually and funky enough to be a hit with her friends. Any gift that elicits shrieks, tears, hugs and jumping up and down like a kid is a home run! Gave this to my Mom as a gift. Perfect for the life-long White Sox fan. She loves it! What a cool gift for my 13 year old son who is a true Yankee fan! here's the catch, the disclosure notice tucked away in the beautiful little box that says that the product may cause illness??? i'm guessing because of the lead paint? so I did return it. Was a gift for my husband who grew up in Chicago and fell in love with the Cubs and baseball as a young boy. A one of a kind gift! My husband bought me the Polo Grounds necklace for Christmas a few years ago. I get so many complements on it, and really enjoy recounting the story behind the piece to people. I bought the Yankee Stadium necklace for my maid-of-honor for Christmas this year. I was charmed by the recycled t-shirt bag it came packaged in, and can't wait to hear what she thinks of it. 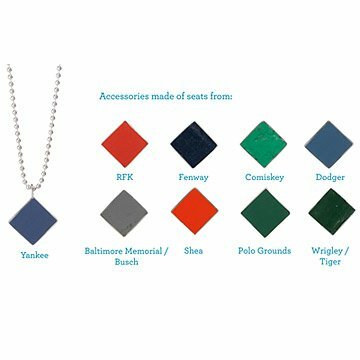 Any baseball-loving gal will adore this jewelry. Can't wait for the bracelet!